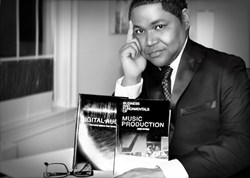 Music Producer and Associate Professor at Long Island University Brooklyn, U.S. Tony Dofat is proud to announce the release of his self-published textbooks “Business and Fundamentals of Music Production” and “Introduction to Digital Audio” both available in book stores worldwide and online. He will lecture throughout 14 countries and 35 cities this summer, mostly held at SAE Institutes throughout the U.K. and Europe. 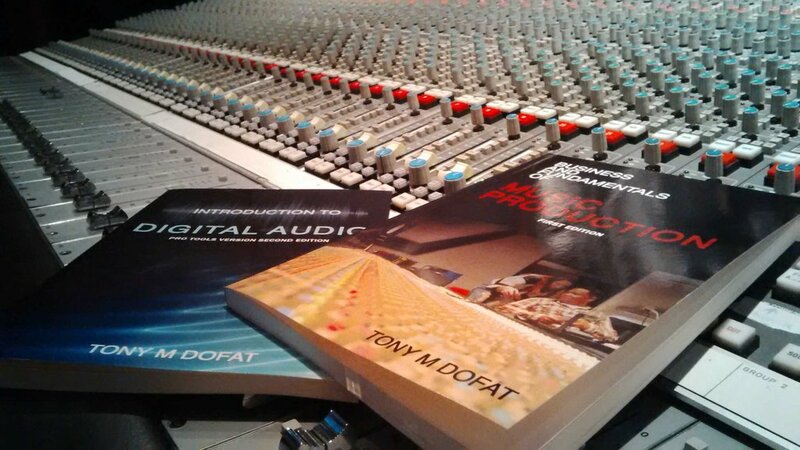 TONY DOFAT is proud to announce the release of his self-published textbooks “Business and Fundamentals of Music Production” (ISBN: 9780578179049) and “Introduction to Digital Audio” (ISBN: 9780578179056). Both books will be available in physical and online bookstores worldwide and will be distributed by Ingram, the largest book distributor in the world. Within the U.K. and Europe, the books will be available at Adlibris, Agapea, Amazon, Aphrohead, Bertrams, Blackwell, Book Depository LTD, Books Express, Coutts Information Services LTD, Designarta Books, Eden Interactive, Foyles, Gardners, Trust Media, Mallory International, Paperback Shop, Superbookdeals, The Book Community, Waterstones, and Wrap Distribution. These books will contain everything you need to know about the business of music production from the creative aspect, publishing your own music, to working with major record labels or creating your own boutique independent label. Music production is more than a hobby, ”this outlet has created a plethora of self-made Multi-Millionaires” as stated by Mr. Dofat. 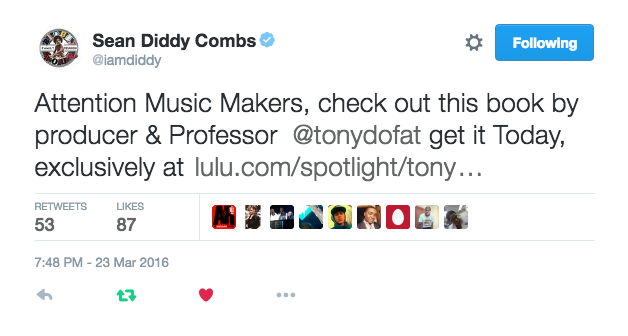 Contributing to over 40 million records sold and 42 RIAA certifications for Record Production, Composing, and Mixing, veteran Bad Boy Records Hit-maker, Tony Dofat has documented the manual to become the next music mogul. “This textbook was written to dissect commercial record production and guide the next young and passionate musicians to the road of music success” says Mr. Dofat. 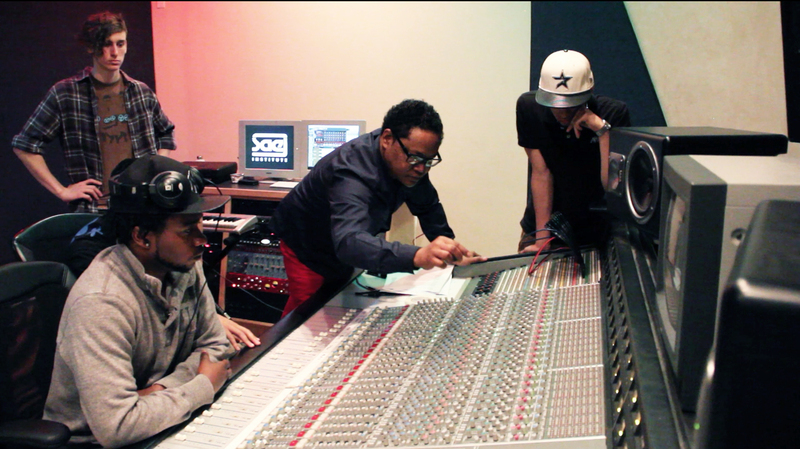 Tony has been active in the music industry for over 25 years as Sean "Diddy" Combs Hitman Producer and has also been a familiar face on MTV’s “Making The Band 2” as the band’s Record Producer and Engineer. Having contributed to numerous classic hits including the Billboard #1, RIAA certified Gold album “Too Hot for TV”, some additional Mega stars he has produced and written for includes; Mary J Blige, Heavy-D, Notorious BIG, Queen Latifah, Ja Rule, Will Smith, Tina Turner plus more, whom has collectively contributed to his massive 170 song catalog. Professor Dofat’s book tour and Lectures will launch in his hometown of Mount Vernon, New York on June 18th 2016, where Mayor, Richard Thomas will accompany him. The remaining dates will be facilitated by SAE Institute; June 23rd Glasgow, June 24th Liverpool, June 25th, Northampton, June 27th and June 28th Oxford, June 29th London, June 30th Amsterdam, July 4th Milan, July 5th through July 9th (Available for booking in Europe), July 10th NYC, July 14th Miami, July 16th NYC, July 19th Los Angeles, July 21 Guitar Center Times Square NYC, July 26 Chicago, September 29th LIU Brooklyn. “We are excited to be a part of this tour to support education and academia as we are looking to grow and recruit more team members, this was a perfect opportunity for both parties” as stated by one of his sponsors, Executive Darrell L. Warden for TeamWarden.TMilesGroup.com which has offices in PA, IN, FL, and MD in the United States.